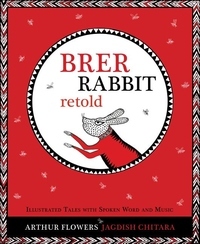 The Brer Rabbit stories were originally oral tales told by slaves from the American South. In this powerful rendering for children and adults, writer and griot Arthur Flowers re-tells them as wisdom tales for a contemporary audience, bringing them back to us as one of the sturdy roots of African-American literature. This version also straddles storytelling forms-connecting the spoken and written word in surprising ways. The text is heir to the original oral stories, exquisitely illustrated by Jagdish Chitara, a ritual textile painter from Gujarat. Arthur Flowers then takes his stories back into the realm of the oral, with a musical spoken word performance in collaboration with a group of young Indian musicians. Printed and bound by hand, this limited edition artists' book includes a music album and short film. This genre defying cross-media project pushes the boundaries of narrative art to a new level of accomplishment. With music cd and download code.